Our mission is to encourage people of all ages and abilities to engage in active and healthy lifestyles by delivering stimulating programs, activities and exceptional customer service. Any form dropped off or mailed will not be looked at until this date. Please note we are no longer accepting telephone registrations. 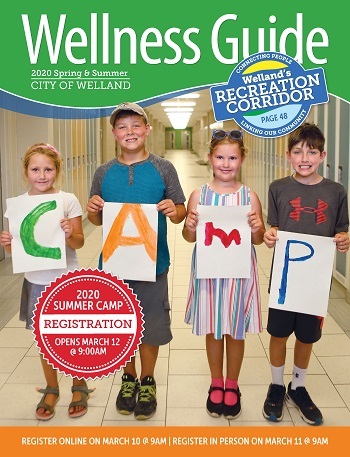 Click on the Welland Community Wellness Guide cover image (right) to look through the interactive, online guide. This guide contains all up-to-date information. Account Activation — BE READY FOR ONLINE! You are only able to register those who reside in the same household. You cannot register for a friend. Un-Enrollment – if someone requests to withdraw you may be next in line! New Class Openings – if waitlists are larger in size new courses may start!